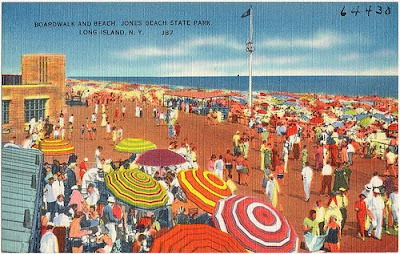 Random Noodling: Poetry Friday--"Jones Beach, 1965"
Last week I shared a postcard poem, and postcards from the Boston Public Library's Tichnor Brothers Collection. I then found a postcard image of a place I remember from my childhood--Jones Beach on Long Island, New York. Jones Beach, Robert Moses State Park, Captree State Park, Fire Island, were all places where I spent lots of time on the beach. Reading, perhaps, but mostly I remember being prone on a blanket baking in the sun. That was a time before sunscreens--ignorance was bliss! tuned to one AM station. The flap of an umbrella. not to burn your soles. thrust deep into wet sand. Clinks of sea glass in a tin pail. The sun, the sun, the sun. waiting to ride the waves. Carol's Corner's the place to be for the Poetry Friday Round-Up, so be sure to visit. If you're in the southern NH area, tomorrow is the 29th annual Friends of the Library of Windham Strawberry Festival and Book Sale. Stop by the Nesmith Library's table and say hello--my stint is from noon to 2:00. Postcard courtesy Boston Public Library. For me it was Good Harbor Beach in Gloucester, MA. Thanks for taking me back, Diane! What a great poem, Diane! I could smell the salt and feel the sun baking me until I shivered. And the memories! Wonderful! The sun, th e sun, the sun...indeed! A feast for the senses, this poem. I have no ocean memories from childhood, but oh, the nectarine juice running down my arm! I'm working on a swim meet poem that features juicy nectarines!! I'm so glad you all enjoyed it. I think, with the possible exception of the AM transitor radios, and the obsolete materials such as wax paper and tin, that the scene could be repeated even today! Now the music streams from one tiny device into one pair of ears. Each song is different. I guess I miss the shared cultural experiences of everyone listening to the same song, watching the same tv program, reading the same magazine. The memories of juicy fruits seem to pop up in a number of my poems over the years! I happy you could relate to the nectarines, Mary Lee! I grew up on Long Island and we spent some days at Jones Beach, but more nights. Before AC we used to go in the evenings in the 50s and walk on the boardwalk, breathe the salty air, listen to the waves crashing in the soupy night and wish we could go down to the water. We lived directly north in Glen Cove, but we didn't get those ocean breezes at night. I spent time at Fire Island Pines and Hither Hills in Montauk and the bay in East Hampton, long before it was "the Hamptons". Even now, when I visit family we head to Jones Beach for the day whenever we can, but not on weekends. This time hovering under umbrellas with sun-protective fabric. And we read, nap and remember. I loved your poem. You really brought back those carefree sunny days. I miss the shows at the Jones Beach Outdoor theater, though!!!! I have always been drawn to the water and I am positive it is because of Jones Beach. Thanks for a great start to my day. Janet F.--did you also head down to the marina for submarine race watching? Those of you who didn't live near the water, what euphemisms did you use for the local "parking" spot? I love this! So much sensory imagery! This poem does a wonderful job describing that beach scene. Many of the references remind me of my childhood in the 70s. Thanks for sharing.